Keeping one’s body and mind healthy is itself the code of Righteousness (Dharma) of every person. An harmonious activity of the body, mind and soul is itself the human life. One acquires physical health by following the regulations of keeping the mind calm, daily routine and seasonal variations. One develops a strong mind by following the rules of righteous conduct (sadvrutta). One attains spiritual health by developing a philosophical attitude and practicing meditation and yoga. Man is the epitome of the universe. Visualizing the self in the universe is the experience of Self realization and experiencing the universe in the self that is blending with the universe is the most evolved state of man. In this state, man experiences the Absolute Truth (Sat), Absolute Consciousness (Chit) and Supreme Bliss (Anand). The treatment of a doctor, vaidya or hakim is successful only when the vital energy bestowed by The Almighty, the bestower of life is conducive to if and the patient gets cured completely. Dr. Vasant Bãlâji Athavale, M.D. (Paediatrics), D.C.H., F.A.M.S., Vaidyacharya is a renowned pediatrician and an eminent author. He stood first in D.C.H. and in M.D. (Paediatrics). He was the founder of the Paediatric Department of the Lokmânya Tilak Municipal Hospital, Sion established in 1959 and was Head of the Department and Professor of Paediatrics for 30 years from 1959-1990. He was the editor of the Paediatric Clinics of India from 1971 to 1990. He was offered Unicef fellowship in 1965 for his paper read at the ‘International Paediatric Conference’ held in Tokyo. He was the chairman of the workshop on ‘Herbal Medicines for Health’ held in Bangkok in 1981. Dr. Athava1e holds the highest degree in Ayurveda, ‘Vaidyáhthya’. He has written several books on Ayurveda and has practically updated the entire Ayurveda through his books. 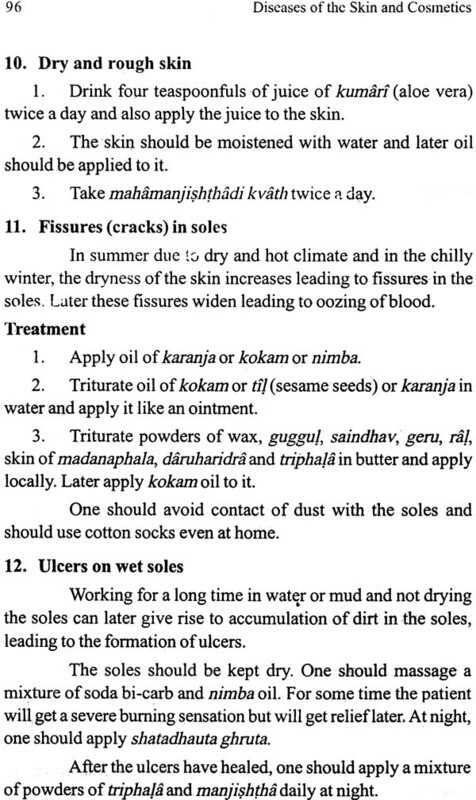 These books in English and Maráthi are written in a lucid language and shall therefore be useful to Ayurvedic physicians as well as the common man. He was awarded the international award for the ‘Best author of Ayurvedic books’ in 1996. He was honoured with a ‘Lifetime Achievement Award’ by the RâhtrIya Shikshaii Mandal at the international seminar on Ayurveda in 2001. Dr. Athavale has also written several books for parents which serve as an excellent guide for bringing up children. Dr. Athavale accords the credit of all his achievements to his parents and teachers. The second author of this book, Dr. Kamlesh Ahavale is the son of Dr. MB. Athavale. He passed his M.D. (Paediatrics), D.N.B.E. and M.N.A.M.S. with a brilliant academic record. He is a dedicated pediatrician and has completed his fellowship in Neonatology from U.S.A. He has made significant contributions in writing these books. The skin is the natural covering of the body. It weighs 10% of the body weight and covers a surface area of 18 square feet. It protects the underlying organs from dust, breeze and alteration of temperature. The skin is the sense organ of touch, temperature and pain. Sunlight helps the skin, to manufacture vitamin D from the fat stored below the skin. The skin controls the body temperature by release of heat and production of sweat. 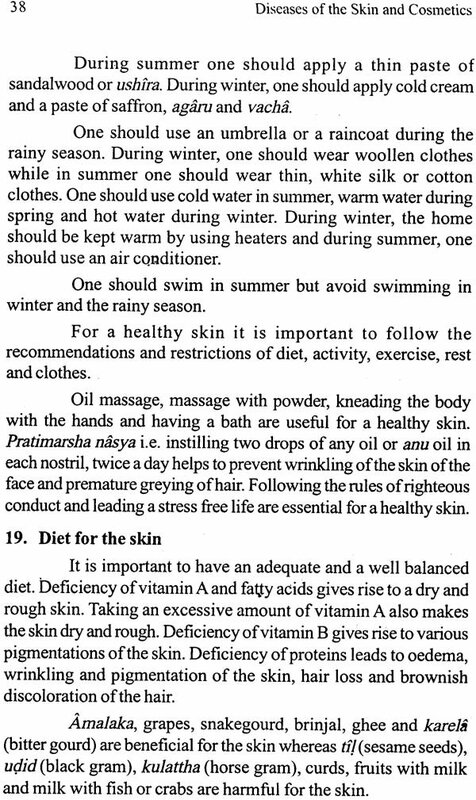 This book discusses various factors which control the colour, complexion and elasticity of the skin. It indicates the diet beneficial and harmful to the skin. It also suggests measures to improve the colour and complexion of the skin as well as medicines which act as tonic for the skin. The book describes various skin diseases and the Ayurvedic concept and treatment of these diseases. It also discusses the care that one has take while selecting and using beauty aids. 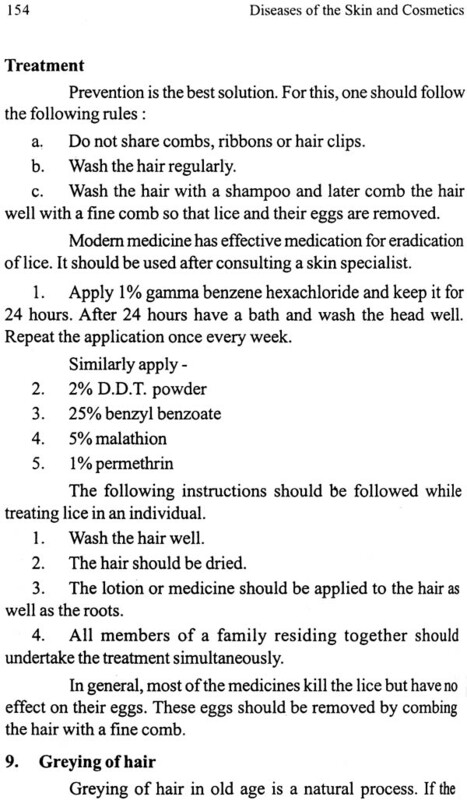 The book also discusses how to take care of the hair and prescribes Ayurvedic treatment for common diseases like dandrufff, lice, etc. 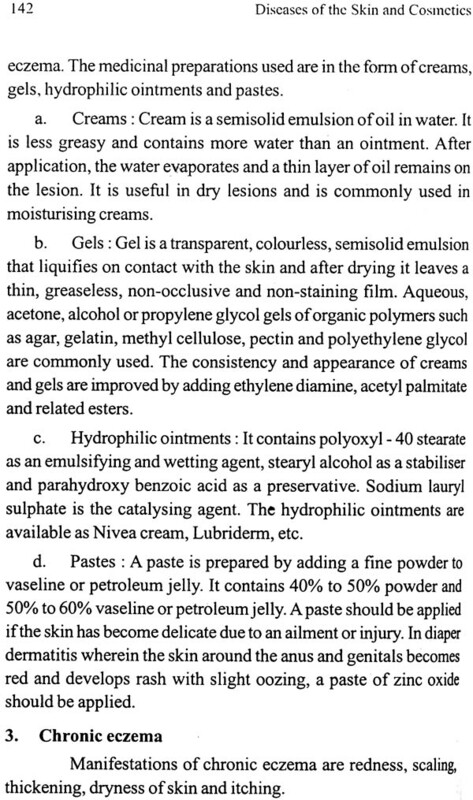 It also describes the skin conditions associated with beauty, e.g. 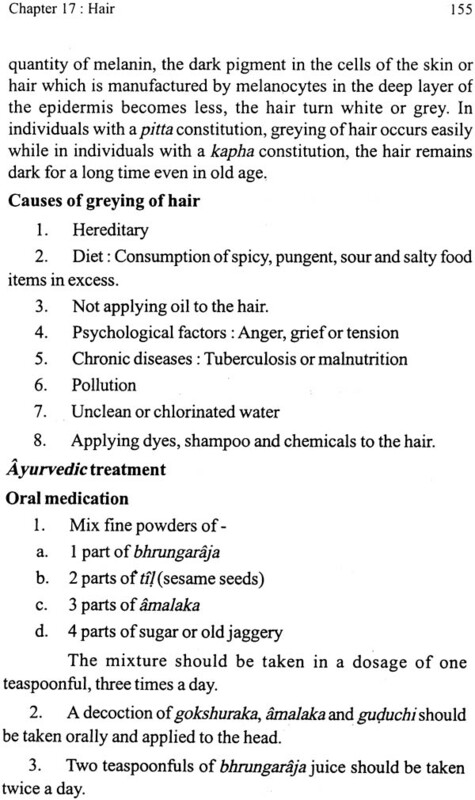 acne, baldness, premature graying of hair, wrinkling of skin, etc. 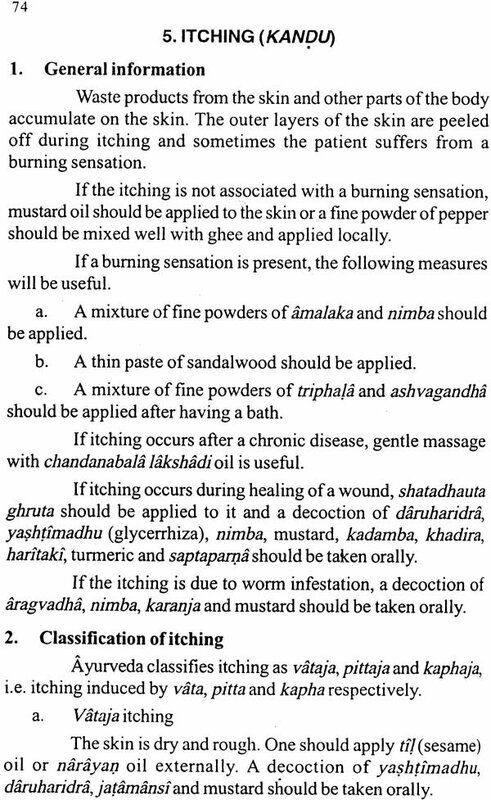 The book lists various groups of Ayurvedic medicines along with their use in skin diseases. The book concludes with a description of various Ayurvedic recipes, their preparation and dosage. 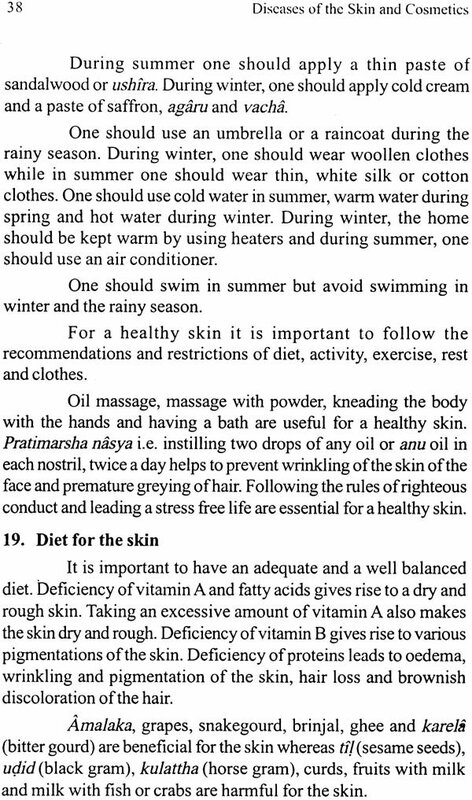 We hope that this book will be useful to skin specialists, beauticians, doctors, vaidyas as well as medical students. It will guide patients with skin diseases and help to prevent skin diseases in healthy individuals. 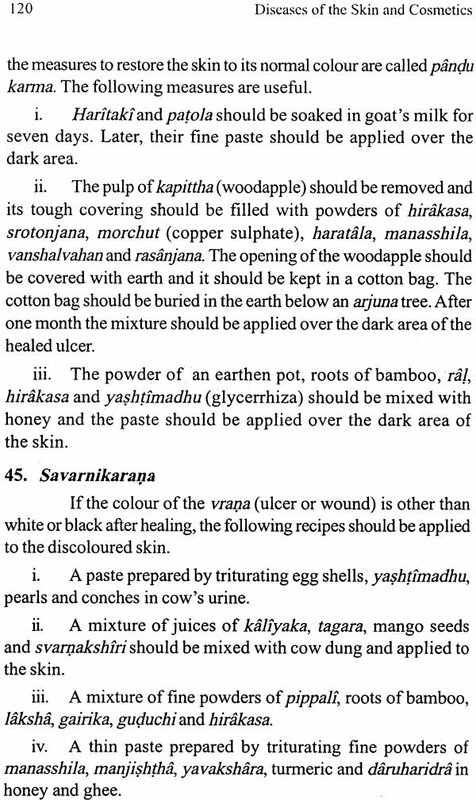 We pray unto the deity of absolute air (väyudevatâ) to bless all the beings with a healthy skin.